We’d love your help. Let us know what’s wrong with this preview of Spiritual Emergency by Stanislav Grof. From Spiritual Emergency to Healing and RebirthIncreasing numbers of people involved in personal transformation are experiencing spiritual emergencies — crises when the process of growth and change becomes chaotic and overwhelming. Individuals experiencing such episodes may feel that their sense of identity is breaking down, that their old values no longer hold true, and t From Spiritual Emergency to Healing and RebirthIncreasing numbers of people involved in personal transformation are experiencing spiritual emergencies — crises when the process of growth and change becomes chaotic and overwhelming. Individuals experiencing such episodes may feel that their sense of identity is breaking down, that their old values no longer hold true, and that the very ground beneath their personal realities is radically shifting. In many cases, new realms of mystical and spiritual experience enter their lives suddenly and dramatically, resulting in fear and confusion. They may feel tremendous anxiety, have difficulty coping with their daily lives, jobs, and relationships, and may even fear for their own sanity. To ask other readers questions about Spiritual Emergency, please sign up. For anyone for whom this subject is relevant, this is a must read! I love the quote, the hero's "counterpart is the demon of resistance." 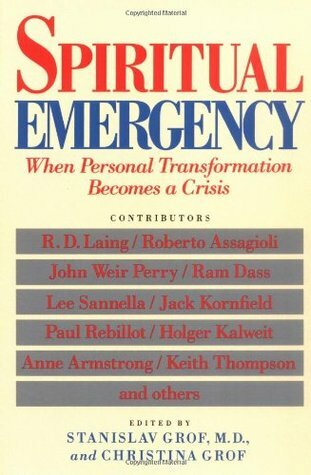 This is a collection of essays around the topic of spiritual emergency. There is a wonderful little essay by Ram Das that is delightful to read, and a great description of kundalini awakening. I love that he stresses the fact several times about being WILLING to do something. Like WILLIING to face pain and pleasure. WILLING to look at our attachments and reflect and change them if need be. Whole book was filled with ways to transform your life. 7. Communications with spirit guides and "channeling"
They outlined and defined each of these states in the introductory chapter of the book and then went on to include articles by authors who are experts in each of these fields of transpersonal experience. excited to read this book as it poses the problem in Western medicine in diagnosing transformative experiences of consciousness as psychotic. distinguishes the difference between organic manifestations of psychotic episode - to be treated with intensive medication vs. viewing some episodes as mystical, transformative and ultimately positively rewarding experience in need of support and understanding in medical community. A strong soulful effort to bring gentle balance to a difficult but natural transition, much needed in western culture. Grof is known for his early studies of LSD and its effects on the psyche—the field of psychedelic psychotherapy. Building on his observations while conducting LSD research and on Otto Rank's theory of birth trauma, Grof constructed a theoretical framework for pre- and perinatal psychology and transpersonal psychology in which LSD trips and other powerfully emotional experiences were mapped onto on Grof is known for his early studies of LSD and its effects on the psyche—the field of psychedelic psychotherapy. Building on his observations while conducting LSD research and on Otto Rank's theory of birth trauma, Grof constructed a theoretical framework for pre- and perinatal psychology and transpersonal psychology in which LSD trips and other powerfully emotional experiences were mapped onto one's early fetal and neonatal experiences. Over time, this theory developed into an in-depth "cartography" of the deep human psyche.